The future of an Evansville-based company that produces a "private voluntary barter currency" known as the Liberty Dollar is in question after federal agents raided the facility this week, according to an e-mail sent by its founder. Federal officials reportedly raided the group's headquarters, located in a strip mall at 225 N. Stockwell Road, early Wednesday morning and seized documents and precious metals. FBI Agent Wendy Osborne, a spokeswoman for the FBI's Indianapolis office, directed all questions on the raid to the Western District of North Carolina U.S. Attorney's Office. A spokeswoman there said she had no information on the investigation. Bernard von NotHaus, the group's monetary architect and the author of the e-mail, did not immediately respond to a message seeking comment. 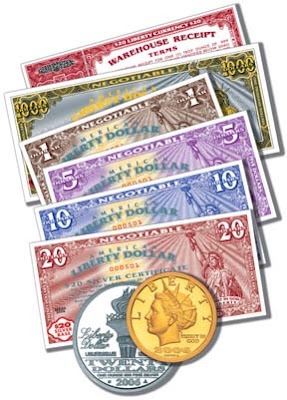 Von NotHaus developed the Liberty Dollar in 1998 as an "inflation-proof" alternative currency to the U.S. Dollar, which he has claimed has devalued since the Federal Reserve was established in 1913. The silver medallions are produced by a private mint in Idaho on behalf of Evansville-based Liberty Services, which also issues paper notes which the group says are backed by silver reserves. Liberty Dollar employees were at the office this morning cleaning up after the raid. They referred all questions to von NotHaus. According to the e-mail, about a dozen agents arrived Wednesday morning and seized gold, silver, platinum and nearly two tons of recently delivered Ron Paul Dollars. They also took all the files, all the computers and froze the group's bank accounts, the e-mail said. "We have no money. We have no products. We have no records to even know what was ordered or what you are owed," von NotHaus wrote in the e-mail, which was sent to Liberty Dollar customers. "We have nothing but the will to push forward and overcome this massive assault on our liberty and our right to have real money as defined by the US Constitution. We should not to be defrauded by the fake government money." The e-mail said the gold and silver that backs up the paper and digital currency was confiscated, as were the dies used to mint the Liberty Dollars themselves. As a result, it warns that recent orders placed for Liberty Dollars may not be filled and it encourages supporters to band together for a class action lawsuit. The e-mail repeatedly defends the Liberty Dollar as legal. "You did nothing wrong," von NotHaus wrote. "You are legally entitled to your property. Let us use this terrible act to band together and further our goal to return America to a value based currency."